Even since the dawn of the first human settlements in 5000 BC, agriculture has played a vital role in the development of every civilisation; over 6000 years later, this remains the case today. 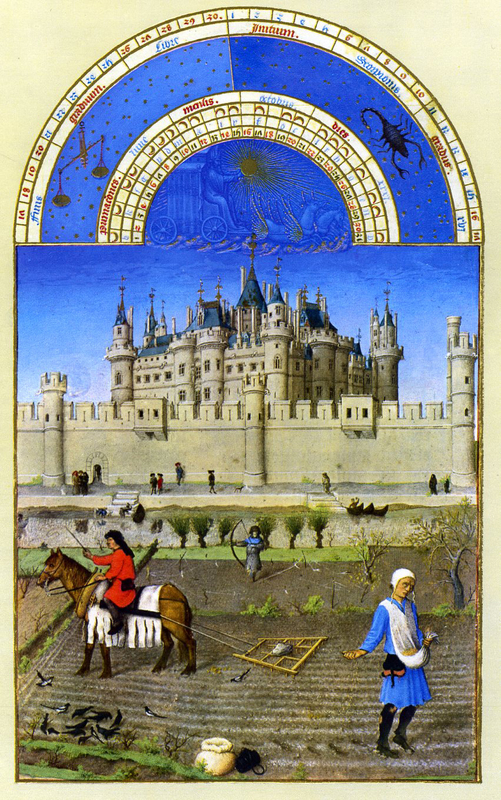 Feudal medieval Europe was primarily an agricultural economy. Only a very small portion of the population lived in cities and they were heavily dependent on the surplus that the agrarian settlements (villages) produced. As we will see, tools had a profound impact on the development of medieval, as well as modern, civilisation. Certain technological developments single-handedly pushed the growth of population across the whole of the continent. In many ways the axe is one of the oldest, if not the oldest, tools in use during the medieval ages. The idea behind a simple, medieval tool like the axe is that its haft essentially works as a force multiplier, allowing its sharp, wedge-like metal blade to focus this force onto a very small amount of surface area. The axe was thus a very powerful cutting tool, that also slightly extends the reach of the user. Villagers used the axe mainly for two jobs; cutting wood and killing animals – primarily wild boars, which threatened their families or livestock. Cutting wood was essential for a variety of tasks, from providing their house with fuel for the hearth, to building structures and even other tools. Finally, the axe was also used to humanely end the life of livestock before bleeding them (to ensure that the meat doesn’t spoil). Europe was not the only place where the agricultural flail was used as an improvised weapon. In southeast Asia, short agricultural flails, originally employed in threshing rice, were adapted into weapons such as the nunchaku or sansetsukon. The flail consisted of two pieces of wood – a longer handle and a shorter, thicker ‘striker’. The two wooden pieces were connected by a leather strap, passed through holes or metallic loops at their connecting ends. The flail was used to separate the grain from the husks, in a process called threshing, after they were harvested. The flail (medieval tool) also inspired the creation of the flail (weapon). Originally this was used as an improvised weapon, but later became a standard man-at-arms weapon. As a weapon, rather than a medieval tool, the flail would have been fashioned almost entirely out of metal. After the soil has been turned using one of the ploughs (see below) and the seeds are sown, the earth must be smoothed so that the seeds are covered and protected. In order to achieve this, medieval farmers used a harrow. The harrow was essentially a wooden frame composed of four to six connected beams. The lower side was set with spikes or nails, made of either wood or metal. The frame of the harrow would be dragged over the ploughed, sown fields, and the spikes would comb the earth smooth, covering over the precious seeds. The fork, or pitchfork, is probably the most popular of medieval tools today, because of its connection with rioting villagers “grabbing their pitchfork”. As with the flail, it was indeed used as an improvised weapon in many cases. The fork has a wooden handle of about five to six feet long, tipped with two or three prongs (or in some instances, as many as four or five), which were usually made of iron. Forks were used to prepare the ground for seeding and covering, in the place of a plough or harrow, for small areas. They were also necessary for the process of making hay, which involved throwing the cut grass into the air in order to aerate and turn it. The aeration of grass prevented the grass from molding which meant that the hay dried and would have been usable as nutrition for the animals during the winter. The ard, also known as the light plough or scratch plough, was a wooden tool that was dragged through the soil, usually by an ox or a work-horse (heavy horse), though sometimes by humans. The ard was similar to the handheld hoe, but because its wooden peak remained semi-buried in the ground it was much faster and more efficient than the hoe. The plough was used to turn and loosen the soil, in order to bring the most fertile part of the topsoil to the top whilst, at the same time, creating a hole where the seeds could be planted. The ard was used with great success in southern Europe and around the Mediterranean where the soil is light and sandy, but was much less efficient in the heavy, clay-rich soil of northern Europe. The heavy plough was a significant improvement on the ard, with a much heavier blade which created a deeper furrow in the ground. Another vast improvement, due to its augmented design, was that the plough deposited the newly turned soil top-down, meaning that any weeds growing would be smothered without having to be removed. Mouldboard ploughs were mainly used in heavy clay areas, where extra measures were necessary to turn the soil, and reaching deeper into the top soil was important in order to make the soil suitably fertile. They would have been much more arduous to draw than light ploughs, but the pay-off in improved yields was significant. Wheeled, heavy ploughs were the last upgrade on ploughing technology during the Medieval era. They were an adaptation of the heavy plough, which made it suitable for the lighter soils of southern Europe and the Mediterranean. The wheels prevented the heavy plough from burying itself in light soil, and the heavier plough blade led to increased crop yields by ploughing more deeply. Wheeled ploughs were not necessary in clay-soil areas, because the viscosity of the soil prevented the plough from burying itself, and nor were they useful; the wheels ended up buried in the cloying soil, halting the plough. However, they were widely used in territories with more sandy soil to increase the fertility of the farmland. The wheeled heavy plough replaced the wooden driver of the mouldboard plough, with two wheels left and right of the plough (see image below). Medieval tools: Heavy wheeled plough (Duke du Berry, Books of Hours, c. 1410): Yup – that’s an actual DRAGON flying over the castle (top right-hand corner). Iconographic evidence, perhaps? For those who didn’t have the resources or the ability to use a harrow, or for smaller areas like vegetable gardens, the rake was a low-tech alternative. The rake worked exactly as the harrow, but on a smaller scale, covering over seeds and smoothing the topsoil. The rake was also used during haymaking to spread and collect grass. Birds – beautiful singing, heralds of spring, winged-disaster for newly planted seedbeds. The average yield of a good field was 1:5, meaning that for each planted seed, you would yield five (nowadays this is closer to 1 to several thousands). Birds could easily lower this proportion to 1:3, which would mean starvation for that serf’s family. In order to prevent this from happening, villagers would equip their children with all sorts of rattles and bells to scare away the birds. For all their simplicity, these medieval tools had a huge impact on the productivity of a field. Barley, oats, grass (and the occasional soul) were no match for the mighty two-handed scythe. The scythe transformed the serf’s life, making it much easier and less tiring, when it appeared in Europe during the 12th and 13th centuries. With a scythe, one could reap a whole area of stalks quickly by using a simple circular movement; the clever design of the bent haft and side handle made the movement quite intuitive. Medieval tools: Scythe (Duke du Berry, Books of Hours, c. 1410). Interestingly, the men are working in the field but the women are shearing the sheep. Shears were mainly used to shear the adult sheep of the flock once a year, cutting their wool for spinning. They were designed like a pair of tongs with knives attached to their edges, and used the thin iron’s malleable properties to return to their original, open position. You can see them in action the picture above (bottom right-hand corner). The sickle was used as a cheaper, more precision-centric scythe, probably for smaller areas and awkward corners. The inner side of the curved iron was sharpened. Sickles usually, as with scythes, had smooth blades; for more robust or hardened vegetation, though, they would have used a saw-toothed blade. Spades were possibly the most versatile of medieval tools, and also have had the most iterations and specializations throughout their history. The shovel was a long, hardened wooden pole with a flat, and sometimes sharpened, metallic head, was used for shovelling manure, digging ditches, preparing vegetable beds in the garden, preparing irrigation and, in some cases when a plough was not available, in order to plough the fields. After the grain crop was thoroughly flailed, the grain seeds were separated from their husks and chaff. The thresher would put all the material in the winnowing basket and then launch it up into the air. The heavy grain seeds would fall right in front of him on the ground (or back into the basket) while the chaff and husks, light as they were, would be blown a few feet away by the wind. Though perhaps not technically a medieval tool, the ox was possibly one of the most significant forces that changed the landscape of the medieval world. Oxen were strong, hardy and unwavering beasts which worked all day, under almost any circumstance. As a serf, owning an ox was a indicator that things were going well. In many cases though, oxen could not be owned by just one serf and they were shared amongst the whole, or part of, the village – this was due both to their worth and their food requirement. Oxes were stronger than a heavy horse, and certainly indefatigable compared to any man. They were able to carry large weights and pull the heavy plough for hours every day. The domestication of oxen was an art that not many mastered, and required fine tuning in order to create a creature which was domesticated, yet still retained its raw strength and physique. We often talk about the importance of the industrial revolution and how it changed the world around us, but not many know that such a revolution occurred during the high middle ages. The invention of the heavy plough (described above) presented a unique implement which transformed the difficult, low-yielding, clay-rich soil of northern Europe from a clearly inferior soil to the most high-yielding farmland a farmer could wish for. Clay is naturally an incredibly fertile soil, but due to its heaviness it was difficult to turn and renew, and thus clay-rich farmland became gradually more infertile. The invention of the heavy plough changed this; in fact it was, almost by itself, entirely responsible for an explosion of population in northern Europe. It was probably the reason that, even with the diminished number of farmers after the outbreak of the Black Death plague, the population managed to re-stabilise and eventually sky-rocket. You can read more about this phenomenon in the article “The Heavy Plough and the Agricultural Revolution in Medieval Europe”, linked in the references below. Can you think of a medieval tool used in agriculture that we forgot to mention? Are there other collections of items you’d like to see or learn more about? Let us know in the comments below, and we’ll try to publish it for you (artwork and all)! All assets created by us are free to use and authorised by the Creative Commons Attribution-NonCommercial-ShareAlike 4.0 International. This means you can use them as you wish for non commercial use by attributing somewhere the creators. If you want the PSD or PNG transparent versions of them, let us know, we are more than happy to share. Medieval Tools by Lost Kingdom Project is licensed under a Creative Commons Attribution-NonCommercial-ShareAlike 4.0 International License. Based on a work at http://www.lostkingdom.net. “Medieval Farming”. HistoryLearningSite.co.uk. 2014. Web. Simkin, J. Medieval Farming Tools. Accessed 2015. The development of the horse collar enabled the move to horses and mules for plowing. The collar distributed the weight on the horse and did not constrict its trachea, and gave it 50% greater capacity to work. The horse then could work more hours than an ox. This lead to the horse replacing the ox in many agricultural areas of Europe.